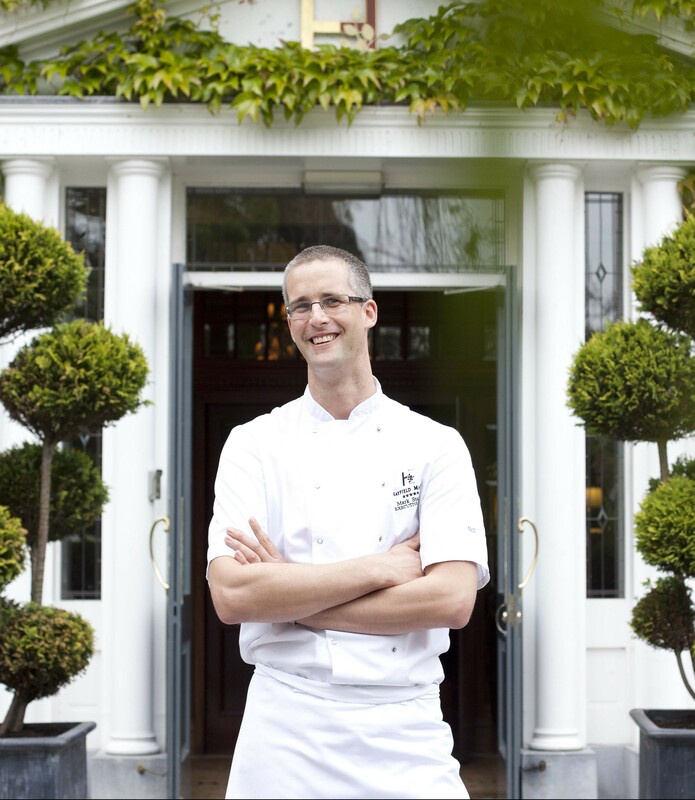 Mark Staples is the Executive Head Chef at the five star Hayfield Manor in Cork. Here is the recipe for his current favourite dish, a Mustard Herb Coated Rack of Irish Lamb with a Sweet Potato Gratin and Minted Pea Purée. 1. In a large mixing bowl toss the sweet potato slices with the oil, thyme, rosemary and garlic until the slices are well coated and well distributed. 2. Transfer to a lightly oiled gratin dish, spreading out the slices with your fingertips. You do not have to layer the gratin piece by piece, but try to ensure that the slices are mostly lying flat. 3. Pour over any cream remaining in the bowl and trickle the remaining oil over the gratin. 4. Bake in a preheated, fairly hot oven (180C/350F/Gas 5) for 40-50 minutes until the sweet potato is completely tender and the top is browned and crispy. 5. For extra crispness you can finish under the grill for 1-2 minutes. 1. Boil peas in chicken stock for two minutes. Once boiled, strain the stock. 2. Place peas in the liquidiser with butter and two mint leaves. 3. Blend slowly to create a smooth purée. Place to the side. 1. Heat the frying pan on a medium heat, add a little oil and fry the lamb racks on all sides until browned all over. 2. Place the lamb skin side down and continue to fry until the fat melts. 3. Season the lamb and transfer onto a roasting tray. 4. Brush the lamb racks with Dijon Mustard. 5. Blend the white bread, parsley, mint and tarragon to a rough crumb in a food processor. Press the herb crumb onto the mustard coasted lamb for 5 minutes. 6. Roast in the oven for 25 minutes at 180 degrees to achieve pink consistency. 7. Remove from the oven and set aside to rest for 10 minutes. 1. Cut the rack into two and divide equally. 2. Place onto serving plates with the sweet potato gratin and spoon the pea puree alongside. 3. To garnish serve with a sprinkling of red wine jus or mint sauce. On the nose this wine is deep and intriguing. It offers so much, it is loaded with ripe fruit such as damsons, blackberries, blueberries and jeweled fruits. There are some well integrated spices plus some lovely floral touches with a leather undertone. The palate has depth to it with all the aromas opening up superbly followed with the addition of lovely ripe red berry fruits. It has a lovely earthy tone to it which is enhanced by its soft lush body and elegant structure. For its price point this wine really delivers. As a pairing it will work beautifully with this lamb dish as the earthy tones of the wine will work the meatiness of the lamb and the sweetness of the sweet potato gratin. Do decant this wine as it does need a bit of time and it makes a dramatic transformation from a light to lush wine. Mark Staples joined the team at Hayfield Manor in November 2014 as Executive Head Chef. Since joining Mark has focused on building, training and developing a brigade of 24 chefs through his own personal passion and expertise. Mark began his career in Scotland before working in London for Gordon Ramsey and Stuart Gillies. He was the Executive Sous Chef at The Merrion Hotel for nine years before moving to Cork. The five star Hayfield Manor is an independent, family owned and operated establishment. A member of Ireland’s Blue Book and Small Luxury Hotels, the award winning Hayfield is a luxurious experience in a beautiful part of the country where visitors are guaranteed excellent quality and service throughout their stay.